Entertaining is in my genes and for my close family and friends, they know how I love creating a huge spread for the various parties I host. When my friend Suzanne announced she was adding on to their family and expecting a boy, I couldn't have been more thrilled for them! 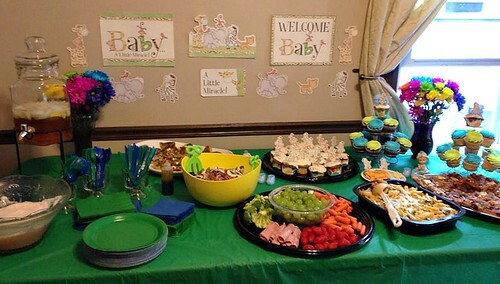 As the days grew closer to her due date, I help co-host a small baby shower for her and was in charge of the shower menu. Roasted Vegetable & Italian Sausage Flatbread - I topped a Garlic & Onion Flatbread with roasted bell peppers, red onion, mushrooms, Italian sausage, zesty pizza sauce, and mozzarella cheese. Goat Cheese, Tomato & Pesto Flatbread - I topped an Italian Herb Flatbread with fresh basil pesto, crumbled goat cheese and grape tomato halves. Bacon, Apple & Cheddar Flatbread - I topped a Whole Wheat Flatbread with Bacon Spread, thinly sliced apples, shredded cheddar cheese and more crumbled bacon. 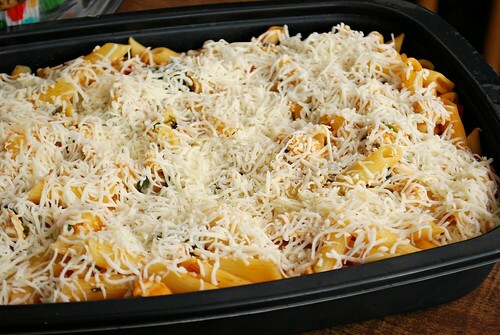 Chicken, Spinach & Butternut Pasta Bake (GF) - I combined GF pasta with sauteed chicken breast, garlic, spinach and a homemade butternut squash pasta sauce, topped with shredded Italian cheeses. Pumpkin Cinnamon Cupcakes/Chocolate Pumpkin Cinnamon Cupcakes - I stirred in a bit of pumpkin puree into both the Cinnamon Swirl and Chocolate Swirl Crumb Cake mixes for a seasonal spin. Some additional dishes on the menu included a Harvest Salad, made with spring mix greens, dried cherries, toasted pecans, chopped veggies and a blackberry orange vinaigrette... GF Snickerdoodle cookies (store bought),,, and a veggie/fruit/cheese/nut platter of fresh broccoli florets, baby carrots, sliced peaches, green grapes, assorted cheeses (harvarti, aged cheddar & white cheddar), nuts (spiced cashews, almonds, pecans), and gluten free crackers. 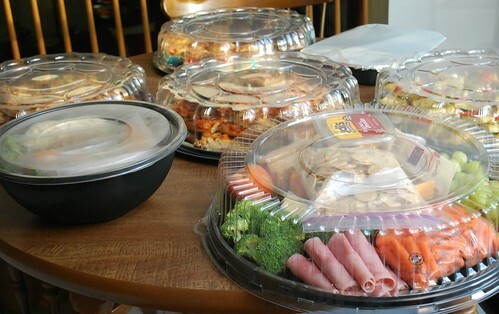 Overall, it was a great spread and the party was a success! 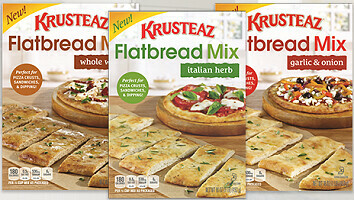 Much of the success was to using these Krusteaz Flatbread Mixes. They are extremely easy to use and fool proof for even those who may hesitate working with yeast. There's only 4 things needed to make these flatbread and half of them are already perfectly packaged for you. You'll need the boxed mix, the included packet of yeast, some water and a touch of vegetable oil. After mixing everything up in a bowl, it;'s just a matter of waiting 10 minutes for it to be ready for forming, topping and baking. However these flatbreads are delicious without any toppings as all... and are flavorful as is. A winner will be chosen and announced on Friday, October 3rd... so think of those flatbread flavors and topping combos to comment with for your chance to win! If you're looking for some delicious inspiration, check out the delicious flatbread recipe ideas from Jen of Hostess with the Mostess with this link to free printables and some Back to School Activities! 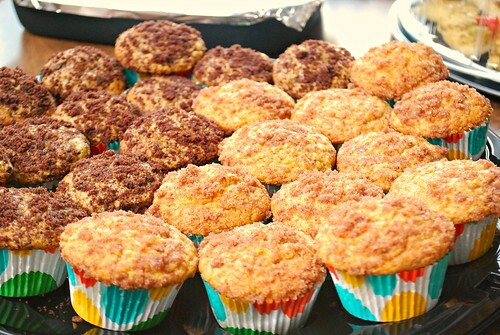 Here's what my fellow Baker's Dozen friends are doing with Krusteaz Flatbread Mixes too! I'm also giving away a sampler of Bacon Jam! The Bacon Jams are a tasty way to enjoy BACON! The Bacon Jams are the perfect addictive blend of savory and sweet. The Bacon Jams come in many unique flavors including All Original, Black Pepper, and Red Chile & Garlic. Our wide variety of flavor profiles ensure the ability to include bacon into any situation breakfast, lunch, dinner, snack, and even dessert. The convenient packaging and naturally long shelf life of The Bacon Jams make them great to keep around the house ready to go for your immediate bacon needs. We use quality ingredients and a passion of cooking to make this fantastic product. We know you will love The Bacon Jams! Winner will also be announced on October 3, 2014 so good luck! The whole wheat flatbread sounds great! I'd top it with some olive oil, sundried tomatoes, artichokes, mushrooms and fresh mozzarella! I follow krusteaz on fb. I grew up using krusteaz products and love them, we used to get the bulk giant boxes at sams club. I am really bad at coming up with combos, so would leave that up to my husband to figure out, all the flat breads sound good. I love Italian herbs and parmesan! How fun. I love how far showers have come these days. Always such amazing food at them. Love the product too, they handed some out at IFBC and I've had a blast using them. We make a chili dog pizza at our house that uses chili in place of sauce with diced onions, wieners and cheese on top. I think the garlic and onion flatbread would go great with this. I would like to try the garlic and onion with chicken, jalapenos and pineapple!